This week the officers of the Urbana Police Division began a new program when they added a prescription drug drop-box for Urbana residents to have as a safe and secure place to properly dispose of unused or expired prescription medications. The division is a beneficiary of the Kid Cents and the Rite Aid Pharmacy Foundation, who approached Chief Matt Lingrell with a desire to help our agency in their efforts to support the safety and well-being of the children in Urbana. Prescription medication misuse is the number one drug crime law enforcement faces. Prescription medications are oftentimes abused by and trafficked by drug offenders. “We know that it is important to identify and meet the challenges surrounding illegal drug crimes, but it is also necessary for us to provide ways in which our community can have to use to help in getting rid of their unused or expired medications,” according to a statement from the UPD. 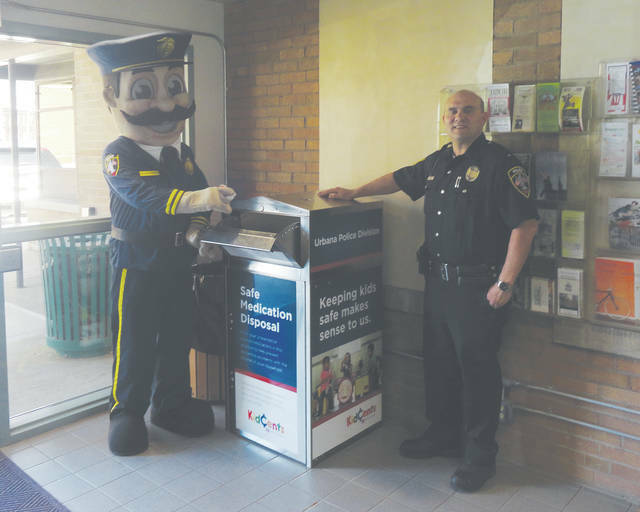 The Urbana Police Division’s prescription drug drop-box is located inside the vestibule area of the municipal building, 205 S. Main St., off of the Market Street entrance. It is secured there and is under 24/7 video monitoring. The property room officer, Kerrie Kimpel, and a police sergeant are responsible for conducting regular checks of the box, inventorying the discarded medications, logging them into the property control system and disposing of the collected medications following regulations set forth by the Federal Drug Enforcement Administration. “We are grateful to the Rite Aid Foundation and look forward to this program helping keep Urbana a pleasant place to live, work and visit,” the statement from the UPD read.